Client side application: Get users permissions, get users subscription token and sends to the backend service. 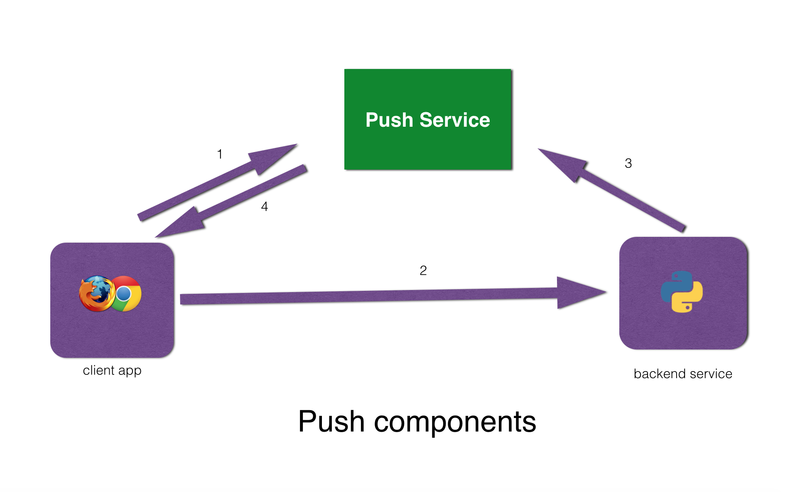 Push Service: Validates push request coming from backend service and forward the push message to the appropriate browser. Backend service: Persists users subscription information and initiate push sending. Full service code can be found here as gist. Follow the gist readme for details about running the service. Rather than writting an application form scratch lets use google push example client app. Which you will find here. Use the 08-push-subscription-change version which is last part of step by step tutorial from Google. Put the VAPID public key in main.js in this variable applicationServerPublicKey. Client side application will use the public key to generate the subscription information. And send the public key which will be used by Push Service. Meanwhile pull the whole code from gist, install necessary packages and run it via following commands. It will return the public key like as key value pair. Copy the public key and paste it to frontend application as value of applicationServerPublicKey in main.js. Click on “Allow” by which you will be giving permission to the application to show web push notification. And the client app will generate the PushSubscription object. Which we will need to send to the our backend service which will persists the information and use to send around a push notification. While writing this blog post Chrome and Firefox only supports push. Here you can find latest supported browser lists. Also I faced an issue with python cryptography library it can not find the right version of openssl and install cryptography based on inappropriate version.